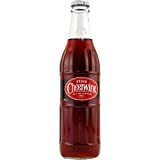 Cheerwine is a carbonated cola beverage made by Carolina Beverage Corp. in NC, USA. The drink is a burgundy colored cherry flavor. Carbonated Water, High Fructose Corn Syrup, caramel color, phosphoric acid, sodium benzoate (preservative), caffeine, citric acid, natural and artificial flavors, red #40. Sugar content: 42 grams (per 12 ounces). 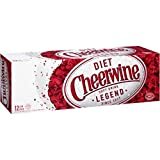 Cheerwine contains 3.96 mgs of caffeine per fluid ounce (13.38mg/100 ml). 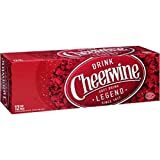 From http://www.cheerwine.com/ Caffeine info from From the Journal of Food Chemistry and Toxicology (see reference 14. ).